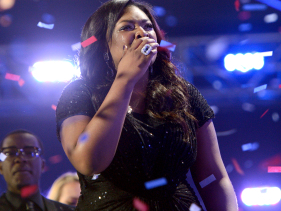 Three times is the charm for Candice Glover, who was crowned the winner of Season 12 of American Idol after trying out – and getting cut – twice before. Tears streamed down her face as she sang her single "I Am Beautiful," confetti raining down on her. It was a rewarding ending for fans and, undoubtedly, the producers, who hoped that a woman would take the title after five years of white men with guitars winning. The last woman to win American Idol was Jordin Sparks back in Season Six. Jordin returned to the show last night for a comedic interlude where the five male finalists – who were picked off one-by-one over the course of the competition – accused the women of sabotage, including accusations of drugging, music changing and lunch money stealing, all purportedly masterminded by Jordin. While the segment was mostly a time-waster, Jordin got one of the funniest lines of the season, "The good news is thatIdol leftovers have been doing really well on The Voice." Before announcing the winner, the show had two hours of airtime to fill, and for once, Idol did not disappoint. A full house of Idol contestants past and present (Adam Lambert! Taylor Hicks! Bo Bice! Kim Locke!) were in the audience to witness the coronation of Candice, and what a show they got. Idol pulled out all the stops, including the top five women and Aretha Franklin (by satellite) performing a medley of greatest hits including "Respect" and "(You Make Me Feel Like) A Natural Woman." Jennifer Lopez returned to the Idol stage with an assist from Pitbull to sing their new collaboration "Live It Up." The judges also hopped on stage to entertain the crowd of more than 7,000 people filling the Nokia Theater. Mariah Carey performed a medley topped off with her latest hit "#Beautiful" with the disembodied voice of Miguel piped in, accompanied by Randy Jackson on guitar. Keith Urban sang his new single "Little Bit of Everything," with a guy playing electric banjo. Candice's duet with former Idol contestant Jennifer Hudson on "Inseparable" comprised an impressive series of runs that got the judges all worked up. Kree Harrison got to sing one of Keith's song with Keith on guitar, Randy on bass and Blink-182's Travis Barker on drums as her backing band. In the immortal words of TV pitchman Billy Mays, but wait, there's more: The Band Perry, who also appeared on Dancing With the Stars this season, stopped by to perform their song "Done" with a guest appearance by Idol contestant Janelle Arthur. Emeli Sandé swung through for a duet of her mega-hit "Next to Me" with Amber Holcomb. Psy performed his not-"Gangnam Style" single "Gentleman," with a slough of vaguely disinterested Asian Robert Palmer girls backing him up. The top five men performed a medley of retro hits with music legend Frankie Valli. Angie Miller sang David Guetta and Sia's "Titanium" with Lambert, followed by the long-promised duet with Angie's personal hero Jessie J, who was sporting a bald head for cancer awareness, on the song "Domino." The good news: Jessie J invited Angie to the U.K. to perform Angie's forthcoming single in concert. The bad news: They got Adam on stage again and didn't let him talk. But last night wasn't just the night America crowned Candice as their Idol. Last night also signified the end of an era: It was Randy's last night as a judge on the show. Jackson has been on the panel letting people know who was "in it to win it" and who "was pitchy, dawg," since the beginning. While Simon Cowell and Paula Abdul have been gone for a while, and the show survived, it's hard to imagine Idol without Randy. Since Nicki Minaj has also announced she's leaving and Keith and Mariah's fate is unknown, it's really unclear what Idol will look like next season. For the first time in a long time, I can't wait to watch Idol next season. See you next year!